Borodino, where the Russian and French armies clashed on Sept. 7, 1812, is known throughout the world through the incomparable description of the battle in Leo Tolstoy’s War and Peace. In Russia, however, the battlefield has achieved an almost spiritual significance, and has been preserved as a national shrine. Don't believe in miracles? Well, we can assure you, Brumfield's work is undoubtedly just that. You can find some of his other articles on RI here. The Battle of Borodino – known to the French as the Battle of Moscow – is thought to have been the bloodiest in all the Napoleonic wars, exceeding even Waterloo. The French won a tactical victory, yet they failed to destroy Russian forces under the command of Prince Mikhail Golenishchev-Kutuzov (1745-1813). Although the retreat of the Russian army after Borodino resulted in the destruction of much of Moscow, the occupation of the capital led not to Russian defeat, but to the disintegration of the French Grand Armee. 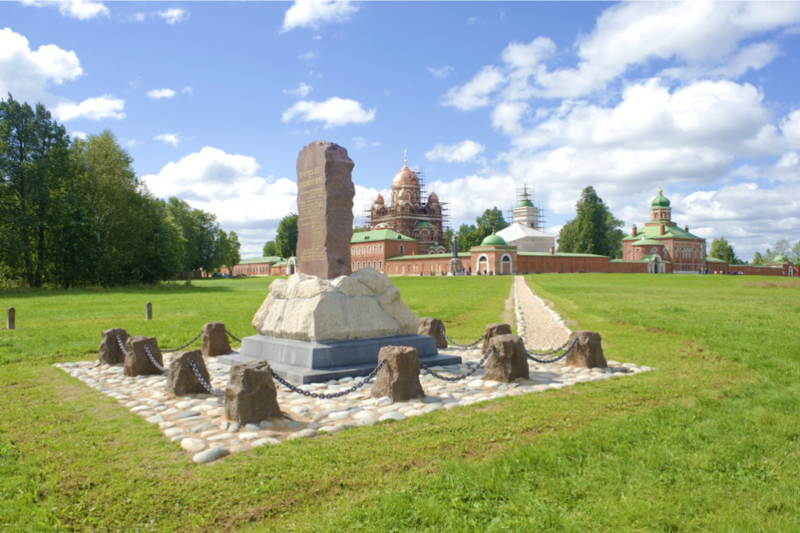 The usual approach to Borodino is from the city of Mozhaisk, located 56 miles west of Moscow, and the group of monuments that form the memorial begins a few miles west of Mozhaisk with an obelisk at the village of Gorky. It was here that Kutuzov had his headquarters during the battle. The obelisk, erected in 1912, has a golden sword on the shaft and is crowned with the spread-winged form of an eagle in flight. Its base contains a bronze relief of Kutuzov surrounded by his closest associates. A short distance beyond the Kutuzov monument, the road passes by the graceful Church of the Smolensk Icon of the Virgin, which overlooks a corner of the battlefield. Originally dedicated to the Nativity of Christ, the whitewashed brick structure was built in 1697-1701 in a decorative style suggestive of 16th-century architecture. 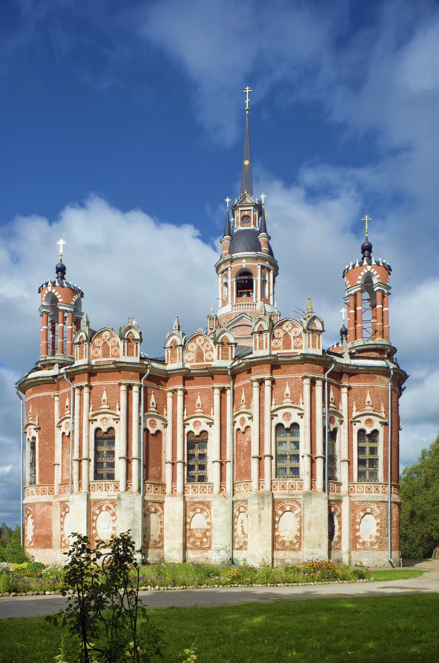 The church has two stories, the lower is dedicated to the Smolensk Icon of the Virgin, which is revered as a protector against Russia’s enemies from the west; the upper church remains dedicated to the nativity. 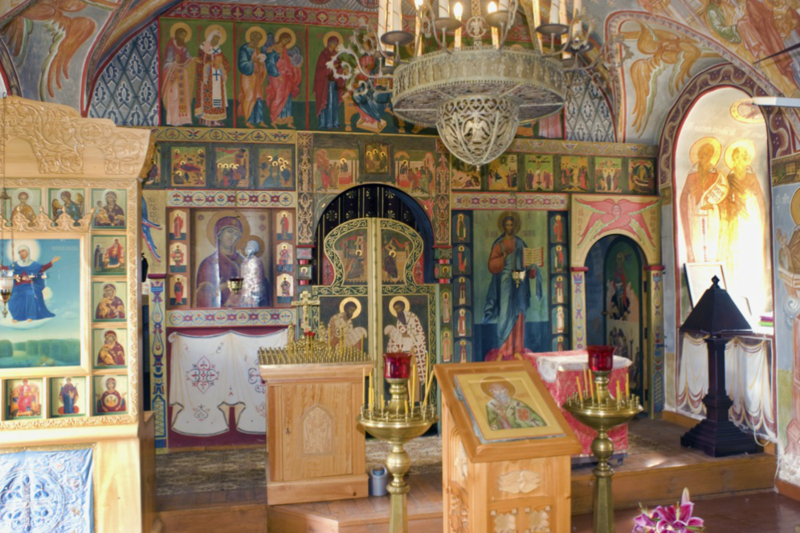 Although vandalized during the Soviet period, both levels have been returned to active use, with new wall paintings and icon screens. The church is crowned with a dome and high decorative cross. At the west end is an octagonal bell tower. During the Battle of Borodino, the church dome was hit by artillery fire. On the slope below the church stands a large wooden house (or small palace) built for the imperial family in 1839 after their purchase of Borodino in 1837. The structure was converted to a military hospital in the late 19th century and was severely damaged during the German occupation of the area in the fall of 1941. It has now been rebuilt in preparation for the bicentennial of the Borodino battle. Beyond the church and palace, the road turns toward the main battlefield memorial, which contains a small refurbished museum. The field itself is dominated by the large obelisk 90 feet tall, which is the primary monument to all Russian soldiers who took part in the battle. The monument was designed by architect Antonio Adamini and dedicated in the presence of Tsar Nicholas I in July 1839. In 1932, the obelisk was destroyed by the Soviet regime because of its association with the tsarist era and the Orthodox Church. The Cathedral of Christ the Savior in Moscow, which was built to commemorate the victory over Napoleon, was destroyed around the same time. However, after Nazi Germany attacked Borodino field in October 1941, the spirit of 1812 was rekindled and in defense of Moscow. Later a T-34 tank on a pedestal was installed down the slope from the main monument. During the latter half of the 19th century, the Spaso-Borodino Convent became a shrine to Russian military valor. 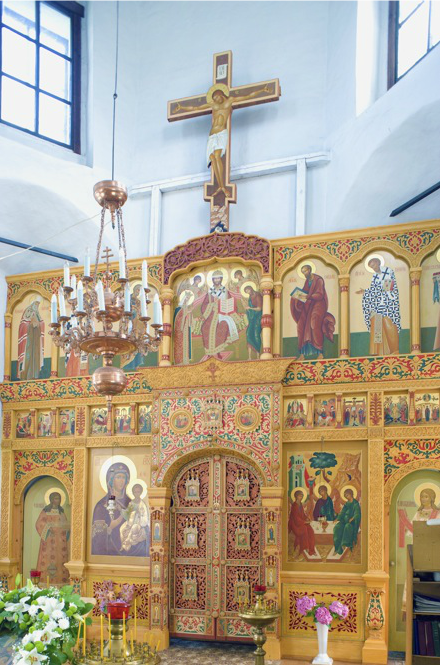 The main cathedral is dedicated to the Vladimir Icon of the Virgin, which is believed to have miraculously caused the retreat of the conqueror Tamerlane from Russia in 1395. The nearby Church of the Decapitation of John the Baptist is considered a memorial to soldiers who perished in battle. In 1867 Leo Tolstoy visited the convent and stayed overnight at its hostel. 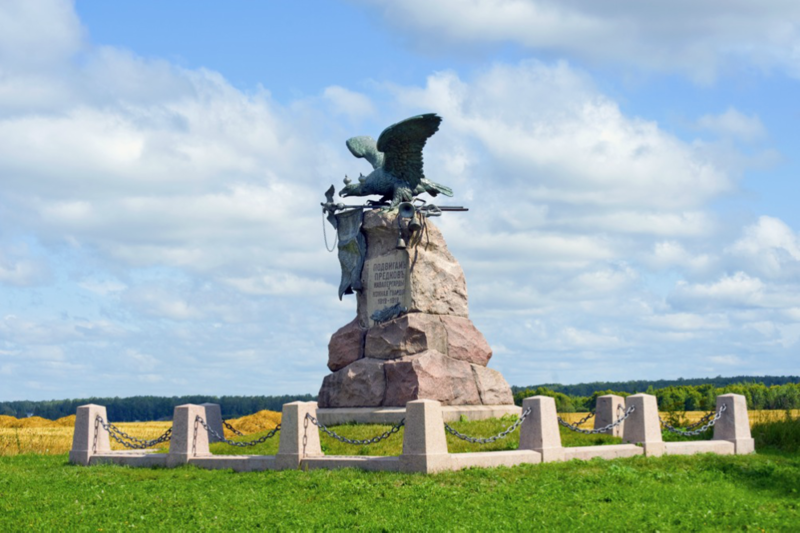 Of the many battlefield monuments scattered over Borodino field, most of them (33) were erected to honor valorous military units during the 1912 centennial observance. Most of them are dated Aug. 26, since that is the Old Style (Julian) calendar date of the battle. Two years after this notable Borodino centennial, the guns of August 1914 brought forth cataclysm whose shocks would reverberate throughout the 20th century. Thankfully, this now seems a distant memory. But Borodino Field reminds visitors of the enduring power of the past.